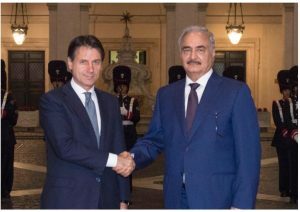 Khalifa Hafter has confirmed his participation in the Palermo Libya conference in November during his Rome visit on Sunday (Photo: Italian Government). Italy’s official government website reported Conte saying that he had a long and articulate meeting on Sunday evening with Haftar which included an exchange of views on the Libyan situation. Hafter was visiting Rome on Sunday ahead of the Palermo Libya conference. Conte reiterated that it will be a “Conference for Libya and not on Libya”, based on two fundamental principles, such as full respect for the assumption of responsibility on the Libyan side and the inclusiveness of the process, which is part of the path traced from the United Nations plan. The Italian Government’s report said Haftar has confirmed his participation in the Palermo conference, ensuring his availability for a constructive and constructive debate that represents the premise of a real unification process in line with the continuing expectations of the Libyan people. The Italian Government said that the presence in Palermo of all the main Libyan actors is aimed at supporting the conditions of security and economic development, as well as the strengthening of the political-constitutional framework, as a basis for an orderly political process based on the UN Action Plan. Conte reiterated the role of facilitator that he proposes to assune during the Palermo conference, an action that can benefit from the presence and support of many members of the international community, he concluded.